In 1798 and 1799 Breitkopf & Härtel negotiated with Mozart’s widow Constanze for access to some of Mozart's works. The result was the frequently reprinted Oeuvres Complettes—17 volumes of scores of vocal and instrumental chamber music published between 1798 and 1806. 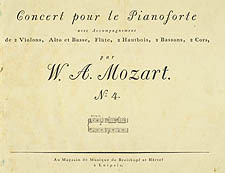 Between 1800 and 1804 Breitkopf also published a parallel series, Concerts pour le Pianoforte, which contained sets of parts for 20 concertos, many published for the first time. This was not the first edition of K. 450, however, which had appeared two years earlier in Vienna. The formats of Breitkopf's publications followed the eighteenth-century custom: music for two, three or four performers appeared in scores or parts or sometimes both, whereas music for larger groups was usually available only as sets of parts. [top] Wolfgang Amadeus Mozart. Oeuvres complettes, 17 vols. (Leipzig: Breitkopf & Härtel, [1798-1806] [middle and bottom] Wolfgang Amadeus Mozart. Concert pour le Pianoforte, avec Accompagnement de 2 Violins, Alto et Basse, Flûte, 2 Hautbois, 2 Bassons, 2 Cors, no. 4. Leipzig: Breitkopf & Härtel,  .